I had hoped to post this yesterday but the day got away from me. When I started my half marathon training plan I used Excel to modify the plan as I went, and to track my actual workouts. I also added a notes field to the end of each week. I believe that self-reflection is crucial to any important endeavor and I knew that keeping a training diary would help me reflect on and analyze my training. I am a week and a day past my half marathon so I thought it would be nice to write a post analyzing my training. I am scoping out more races, and I know that this analysis will be crucial in forming a new plan. I was able to do yoga every Monday. Weekly yoga practice is something I plan to continue in any running plan I do, and as a life tool. I think it’s helped me to be more balanced, flexible, and mentally strong. All great benefits for a runner! Every Sunday was labeled crosstrain, which for me meant a bike ride plus strength and core work. I started biking regularly when I started following this plan. I tried to match my distance to my long run distance for the week. Once I got my Garmin, I made a point to keep my heart rate in zone 2 for these rides to help build my low and slow cardio base. I've really enjoyed using my bike more regularly. Unfortunately, the Sunday after my race my quads would not let me ride and today it was raining so I biked at the gym instead (not as satisfying!). In terms of the runs, I pretty much stuck to the plan in terms of distance and type of workout, although I didn't always do them in the order I had written. 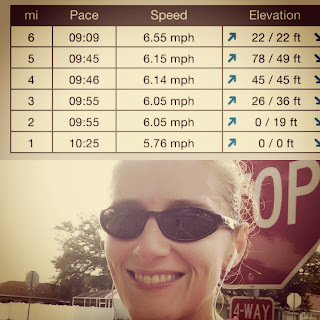 I did all my long runs on Saturday morning at the same time as my race and made a point to use these runs to develop and practice my nutrition/hydration plan. I had to take some time off when I got strep throat, and I chose the type of weekly run based on how I was feeling when I got up in the morning and the weather conditions. The most inconsistent part of my training was what I did for my strength training exercises. I varied between a modified version of the plans from “Thrive Fitness”, a timed 30 seconds on/10 second rest series of 3 sets of 14 exercises, and random amalgamations of plans I’d found online for runners. The two biggest weaknesses of my race day were not slowing down for my nutrition/using a new source, and not having had any hill practice. I think in the future I will stick to dates for fuel. I also might take in more fuel before the race. A banana is great when I have just gotten up and will be running in a half hour, but I don’t know that it was sufficient for having been awake for almost 2 hours before the race started. Lack of access to hills is an issue. I might use the cooler weather to do some hill runs in the evenings after work, something that is impossible here in Florida for much of the year. I also will incorporate more leg work into my strength training. I think I was afraid to make my legs sore for my midweek runs and I paid the price during the race. I am thrilled overall with my ability to train, recover, and perform in my first half marathon. The more I talk to other runners, the more I realize that running a half marathon about six months after starting to run outdoors seriously without any real race experience (besides a 150 person fun run 5K) was not an easy task. I probably should have stepped up to a 10K, but the timing and location for this race were too tempting. The last few weeks of my training after I had strep were admittedly more difficult, and I had a harder time recovering. I did some routine blood work recently and have found out that my blood cell counts are abnormally low and that my cortisol level was high. I am going to see a hematologist tomorrow about it, fingers crossed that it’s not serious. I feel somewhat better knowing that there was a medical reason for the prolonged recovery I needed after my race. I wasn't able to run until Thursday, when I did my first evening run in Orlando. I enjoyed the run and went out with the intention of 3 easy miles, but felt so good that I did a sub 30 minute 5k! Yesterday I wanted to put in a decent distance to keep my endurance up, and I planned for 6 miles. I ended up running the six miles in less than an hour and had negative splits. I felt great after. My next race is a 10K on March 1st, and I found a really intriguing half at Fort De Soto park in St. Pete Beach at the end of March. It’s a flat course that runs by the water and only has about 900 participants. I think the 10k would fit nicely in a training plan as a step down week plus more race experience. I have until the end of the month before prices go up, so I will likely sign up if the doctor gives me the okay.